Water Resistant Inkjet Paper 140gsm. This high quality paper is superb for mounting external graphic..
180 micron Tear Proof Matt Banner Film. This economical, tear proof matt film provides outstanding l.. Gloss Tear Proof Matt Banner Film. This economical polypropylene tear resistant gloss film provides ..
180 micron Tear Proof Matt Banner Film to fit Canon TM-200 & TM-205 Printer. 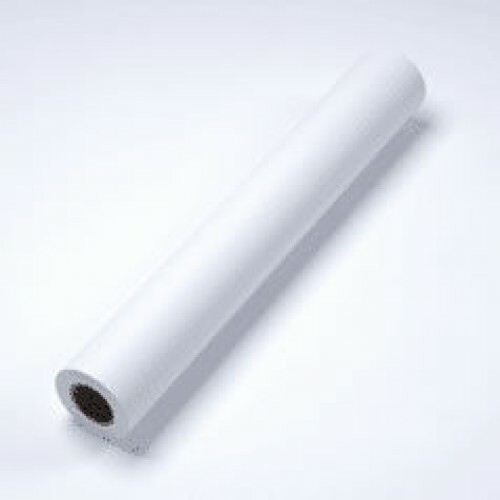 This economical, te..
Water Resistant Inkjet Paper 140gsm to fit Canon TM-300 & TM-305 Printer. This high quality pape..
HP Designjet T520 A0 Water Resistant Inkjet Paper 140gsm. This high quality paper is superb for moun..
Our Water Resistant Inkjet Paper in a 140gsm weight is ideal for short term outdoor prints, including maps and plans, that will be exposed to the elements. This is an extremely versatile paper that has a smooth, matt coated finish and is suitable for use with dye and pigment inkjet printers, guaranteed to dry quickly and provide good line sharpness for professional results. This is an ideal paper for many different purposes that may require you to bring your prints into the open air, and will withstand high humidity and moisture, even a rain shower, without the ink smudging or the paper disintegrating. It's unique flexible coating is resistant to cracking and will accept a high ink resolution of up to 1440 dpi with excellent edge definition of images. For prolonged outdoor use, we recommend you laminate your prints or use our Tear Proof Matt Banner Film 180mu which will offer you a high level of durability. This paper is also available in 914mm and 1067mm rolls. HP Designjet T520 Water Resistant Inkjet Paper 140gsm. This high quality paper is superb for mounting external graphics. It has a unique flexible, instant drying coating which is resistant to cracking and will accept a high resolution up to 1440dpi with excellent edge definition of images. This versatile paper offers an optimum level of water resistance in areas of high humidity and moisture using both dye inks and pigmented inks. It is compatible with thermal and piezo technologies. For prolonged outdoor use we recommend the paper is laminated.